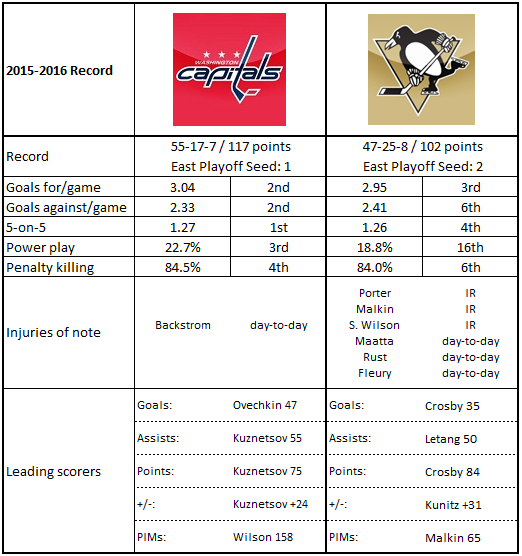 The Washington Capitals take the ice for their penultimate home contest of the 2015-2016 season on Thursday night when they host the Pittsburgh Penguins at Verizon Center. It would have been the “ultimate” home game of the season but for the rescheduled home contest with the Anaheim Ducks, postponed due to Winter Storm Jonas in January to this coming Sunday. If not the ultimate home game, the Penguins offer much as an ultimate opponent. They are on a roll that looks far too ominously (if you are a Caps fan) like the 2008-2009 run they made to finish the regular season on their way to a Stanley Cup. Since March 11th, when they defeated the Columbus Blue Jackets, 3-2, the Penguins are 13-1-0. Compare that to their 18-3-3 finish in 2008-2009 that served as a springboard on their way to the Cup that season. This club is doing in at 5-on-5, outscoring opponents by a 40-21 margin; they are doing it on special teams, outscoring opponents by a 10-6 margin on their respective power plays. That Penguin power play is 10-for-49 (20.4 percent), while the penalty killers are 38-for-44 (86.3 percent). In that 13-1-0 run, Sidney Crosby has reclaimed his spot as the game’s most dangerous offensive weapon. He is 7-11-18, plus-7 in those games, a scoring level more impressive for the fact that Pittsburgh’s other outsized weapon – Evgeni Malkin – has been out of the lineup since sustaining an upper-body injury in the win over Columbus that set the Penguins on this run. Crosby is one off the league lead in multi-point games with 25 (Patrick Kane has 26), and since he came into the league in the 2005-2006 season he has more such games than any other player (279, one more than Alex Ovechkin). If Crosby does have a weakness, it is in the disparity of his home and road scoring this season. At Consol Energy Center he is 25-26-51, plus-17 in 40 games. On the road he is 10-23-33, plus-1 in 39 games. But take small comfort in that. Crosby has points in ten straight road contests (4-10-14, plus-5). He is 18-36-54, plus-3, in 37 career games against the Capitals. If Crosby is worming his way into the conversation about potential Hart Trophy winners as most valuable player, Kris Letang is certainly going to be in the conversation of Norris Trophy-worthy defensemen. Letang is third in scoring among defensemen (16-50-66) despite having played in 70 games, ten fewer than both of the players ahead of him – Erik Karlsson (16-64-80) and Brent Burns (27-47-74). It is already a career year for Letang in goals (he had 11 in each of the two previous years), assists (he had 42 in 2010-2011), and points (he had 54 last season). In this most recent 14-game run of good fortune for the Penguins, Letang is 4-11-15, plus-9, and he has points in each of his last seven games. In 26 career games against Washington, Letang is 4-7-11, minus-13. The Penguins score enough (third in scoring offense overall, 4.14 goals per game over their last 14 contests) that they do not need elite goaltending to be successful. They are getting it, though. Among 33 goalies having logged at least 2,000 minutes this season, Marc-Andre Fleury ranks tied for fourth in wins (35), eighth in goals against average (2.29), and tied for ninth in save percentage (.921). His five shutouts is tied for fourth in the league; his .933 save percentage at 5-on-5 is fifth in the league, as is his “high-danger” save percentage of .858 (numbers from war-on-ice.com). And, he is 8-1-0, 1.98, .915 in this 13-1-0 run. He is also out of the lineup with a concussion as reported last weekend. He is not expected to play in any of the Penguins’ last three regular season games. Which brings us to Matt Murray. Resembling the Vancouver Canucks’ Ryan Miller in build (6’4”, 178), he is doing a pretty good job of resembling Miller in his prime in on-ice performance. In 11 appearances this season he is 8-2-1, 1.98, .930, with one shutout. However, a certain unevenness has been creeping into his game of late. In five appearances in this 13-1-0 run, Murray is undefeated, but his goals against average of 2.69 is unremarkable, and his .925 save percentage is influenced by his pitching a 24-save shutout at the New York Islanders on April 2nd. He also has a three-goals allowed and a four-goals allowed performance in his last four games. Murray lost his only career appearance to date against the Caps, allowing three goals on 37 shots in a 3-2 Caps win on March 1st. 1. Pittsburgh can score goals in bunches. They have 33 games this season in which they scored four or more goals (a 32-0-1 record), a total topped only by the Dallas Stars (35 games). 2. That goal scoring comes from being able to make goalies work. No team in the league has had more games with 35 or more shots on goal that Pittsburgh (30). Dallas and Los Angeles trail with 29 games each. 3. Six of the Penguins’ last nine wins have been by three or more goals. 4. The Penguins have the best record in the league when leading after two periods (38-0-0). 5. In their 13-0-1 run, the Penguins have a stunning 57.1 percent Corsi-for at 5-on-5. Of those 14 games, they were over 50 percent 11 times and over 60 percent four times (war-on-ice.com). 1. Washington has the second-best special teams index in the league (107.1, the sum of power play and penalty killing percentages). Only Anaheim (110.3) is better. 2. The Caps have played almost all of their time over the last two games at even strength. Over more than 120 minutes of play, the Caps and their opponents split a total of six power plays, none of them resulting in goals. 3. Now that we are in the last few games of the season, and everyone who is looking at the Caps’ last 25 games thinks they will be one-and-done in the postseason, here is a fun fact. In the post-2004-2005 lockout period, the average record of a Stanley Cup winner in their final 25 games was 15-7-3. The range of standings points earned was from 28 on the low side (Detroit in 2008 and Chicago last season) to 40 on the high side (Pittsburgh in 2009). The Caps can finish their final 25 games with a 15-7-3 record if they sweep their last three games, but the only team to do that among the last ten Cup winners was Pittsburgh in 2009. If they lose their last three in regulation, the Caps would finish with a 12-10-3 record, just under the low side of performance in this example. 4. The Caps are still slow starters. They are tied for 22nd in goals scored in the first periods of games (53) and have a goal differential of minus-4 for the season. 5. In their last dozen home games, the Caps have a combined Corsi-for of 52.2 percent at 5-on-5 overall. Not that it has translated into a superior PDO number. Over those same dozen home games, the Caps’ PDO is 99.9 (numbers from war-on-ice.com). When Phil Kessel was obtained by the Penguins in a six-player-plus-draft-picks trade last summer, folks wasted no time speculating on just how many goals he would score as a teammate of Sidney Crosby and Evgeni Malkin. Would he get 40? 50? 60?? Never mind that he had never hit the 40-goal mark in his career to that point over nine seasons. And when he started slow (four goals in his first ten games) and failed to do much to pick up the pace (12 in his first 40 games), one might have been forgiven for wondering if the promise was all a mirage. Kessel might be warming up at the right time, though. He has five goals in his last ten games, the most he had in any of his eight ten-game blocks of games this season. Kessel is 7-15-22, minus-3 in 34 career games against Washington. Evgeny Kuznetsov is eighth in the league in total scoring with 75 points in 79 games. Only Calgary’s Johnny Gaudreau among those ahead of him has more points (77) in fewer games (77). The same Evgeny Kuznetsov does not have a goal in his last 17 games, and over that time he has just ten assists, three of them coming in a 4-1 win over Nashville on March 18th, the only multi-point game in his last 21 games. His progress in his second full NHL season has been nothing short of remarkable, but he is now a player on whom the Capitals must depend to produce if they are to make a deep run in the postseason. The Caps are 36-5-4 in games in which Kuznetsov recorded a point, 14-2-1 in games in which he scored a goal. Washington needs him to put more crooked numbers on the score sheet. In ten career games against the Penguins, Kuznetsov is 2-2-4, minus-3. If you subscribe to the notion that the Caps have lacked the incentive of being in a close race as a reason for their less-than-impressive 11-7-3 record over their last 21 games (after going 44-10-4 over their first 58 games), the Penguins should get their full, clear, and undivided attention. For those first 58 games the Caps were the fox, far out of sight of the 29 hounds chasing them. But now, with the Penguins earning 26 of a possible 28 points in their last 14 games, the Caps look like a hound chasing a new fox. Pittsburgh now appears to be the trendy pick as the team most likely to come out of the East in a Cup final. It is a position the Caps spent two-thirds of the season building. Now, perhaps having ceded it to the upstarts in black and gold, it’s time to take it back. What Game are the Washington Capitals Playing?